An Ordinary Life : Science: Geotechnical engineering and Lego skyscrapers! Science: Geotechnical engineering and Lego skyscrapers! The next science group I will be doing about architecture. I've been thinking a lot about ways I can cover this subject and I thought really I should start from the ground up so this experiment investigates into the foundations of buildings. It also makes for a great maths lesson too! So the question we are investigating is: How Deep Do Foundations need to be? To find this out we're going to take on the role of a geotechnical engineer. It is a geotechnical engineer's job to understand and assess the behaviour of earth materials like soil and rock and understand how earth materials will affect any structure built there. Geotechnical engineers look into any risks to humans, property and the environment, natural hazards like earthquakes, landslides, sinkholes, liquefaction of soil, debris flows and rock falls. After they have finished assessing they will then determine and design the type of foundation and earthworks that is needed for the particular structure to be built. FOUNDATIONS are used in all kinds of structures from the very simple small structures to bridges to the most complex skyscrapers. In this project we will be investigating skyscrapers. We will be using our tall tower of Lego to learn about bearing capacity, which is the ability of the soil to support the load (the weight) of the structure. We will be learning about Slope Stability - another thing that a geotechnical engineer has to take into consideration to ensure that the structure being built won't get damaged by catastrophic events like landslides. A slope is considered stable if the forces stopping the movement are greater than the forces making the movement. We will be investigating different foundation depths to find out which ones work the best. Bigger blocks like Duplo or other connecting blocks around that size. A small ball, a small bouncy ball or a ball pool ball. Fill your baking tin about 4 cm high with flour. Make sure that it is flat and even. First you will need to measure the distance of a and the distance of b. You can do this using a ruler. Then you need to divide a by b. Now you will need your scientific calculator- make sure it has the arctangent button the Tan -1 button. So if a is 5 and b is 20 we will do the 5 divided by 20 which gives us 0.25 so c is 0.25. You must use the brackets on you calculator to make this work and the Arctangent button is Tan-1 on your calculator. We rounded all our calculations to the nearest tenth. When you have done that you will need to put 10 blocks of regular Lego together. You may want to tape them together so they can't break apart because we are not testing the strength of the structure we are only testing slope stability therefore the tower must not come apart in this test to make it a fair test. Now place the Lego tower so it is upright (not leaning to the side like Piza) one brick deep. Pat the flour around it insuring it is sitting tight in the flour. 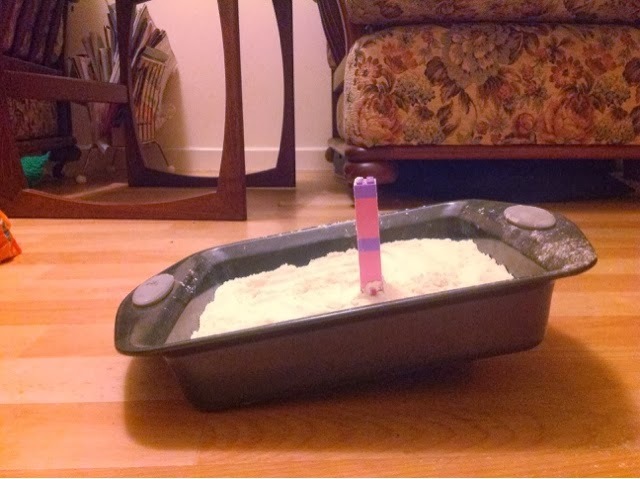 Now you are ready to test the slopes stability! With you tower one brick deep into your flour place the ball at the top of your slope and just let it go. Do not push it in anyway as this will affect the test results and make it an unfair test if you do as the force will always change. If the tower falls over we call this a fail, if it tilts you will notice a crack forms in the flour next to the tower, using a ruler measure how many millimetres gap it is. Now put your tower in the flour so it is 1 and a half bricks deep. Note it down as fail or how many millimetres the gap is again. Do the same as the last two test but this time 2 bricks deep. Do the same again but this time put the tower in 2 and half bricks deep. Do same test one last time but this time 3 bricks deep. MAKE SURE YOU RECORD ALL YOUR FINDINGS CLEARLY IN YOUR SCIENCE JOURNAL. Now change the slope angle! 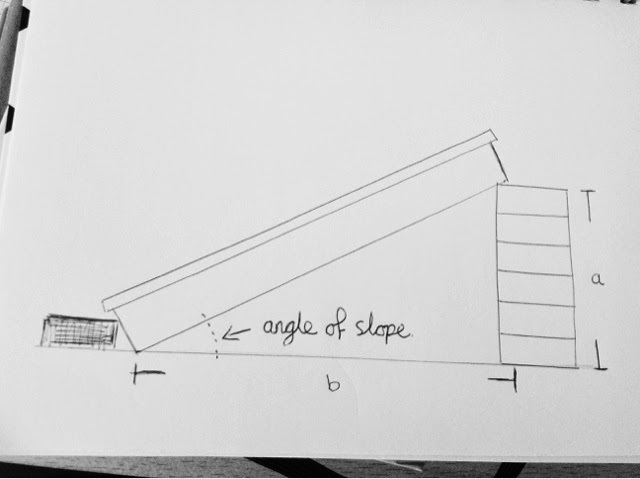 Either bring the angle of the slope down or up by one or two bricks. Now define the angle of the new slope using the same formula as last time and then calling it Slope B. With this new angle repeat TEST ONE to TEST FIVE, ensure you note all measurements and observations down as you go. Define the angle again and then label it Slope C and do the same five tests. Our slopes we used were SLOPE A = 5cm high; SLOPE B = 7cm high; and SLOPE C = 9cm high. Yours may vary but I thought this would be useful as a guideline. 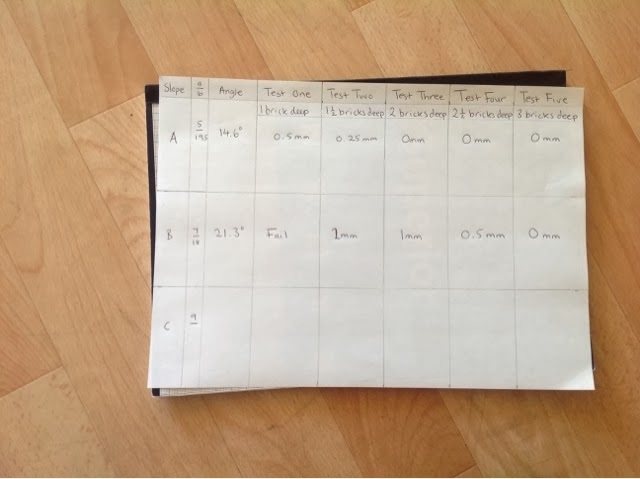 When you have done this you can make graphs to show your results in a more visual way. This includes more maths too! For each slope angle put the foundation depth on the x axis and the gap on the y axis. Where your tower fell down note that down as fail on your table and on your gap. When you have finished don't forget you can always write out a summary of your results and add a conclusion at the end in your science journals. English - if you're writing up the report that is. How many kinds of foundations are there? How do the foundations transmit loads to the soil? After researching into this I discovered that average soil can support at least 1500 pounds per square foot. An geotechnical engineer calculates the weight the structural element transfers to the soil. If a 1ft by 1ft column transfers 6,000 lbs into the ground, and the soil strength is 1500 lbs/sqft, the foundation footing should be 2 ft by 2ft or 4 sqft (4sqft x 1500lb/sqft = 6,000 lb.). How do we know how tall a building or structure can be? It’s possible to go one meter taller than the tallest mountain. That means we could build a skyscraper that is 29,032 feet tall. And theoretically? It could go even taller than that because a building is only 15 percent as heavy as a solid object. To achieve that height, to actually build that skyscraper however would take quite a bit of engineering genius and, quite frankly, a lot of new technologies that haven’t yet been developed. And it likely wouldn’t look like the slender, gleaming spires we’re used to. To achieve that kind of height you need a really broad base to support the weight, much like the way a mountain has a really broad base and tapers as it rises. What are the tallest buildings on Earth? How tall are they? Using soil instead of flour, this is what buildings really sit in after all. Instead of rice you might like to use sand and instead of pasta you might like to use small rocks, like the gravel in a stony car park. Soil liquefaction which describes a phenomenon whereby a saturated or partially saturated soil substantially loses strength and stiffness in response to an applied stress, usually earthquake shaking or other sudden change in stress condition, causing it to behave like a liquid. This looks really simple and effective and like you say there are so many subjects you can bring into one experiment. Just one nit picky thing, being a structural engineer - the examples you gave for bearing capacity are all in imperial units and in UK we use metric exclusively. Was info from an USA site? to convert lb/ft2 to kN/m2, multiply by 0.04788, so 1500 lb/ft2 = 72 kN/m2, which is an average bearing capacity for house strip footings. Have you ever looked up at a skyscraper and thought "That is so cool!"? Building a skyscraper, or any structure, is more than just building the walls, windows, and floors. All structures require a foundation to keep them from falling down. This is especially important when a structure is built on a hill or on a slope. In this science project, you will build a tower of Lego® Duplos® on slopes with different angles. The Engineer works are one of the major tries targeted to the understudies. The shabby,Engineering Assignment writing get helped with the nice piece framing works with in he due date.